Corvette Abuse…. starring Super Dave. In the early ‘90s, my family and I moved from Burlington to Bowmanville because I was spending just about every weekend at Mosport. We lived in Bowmanville until January of 1996. 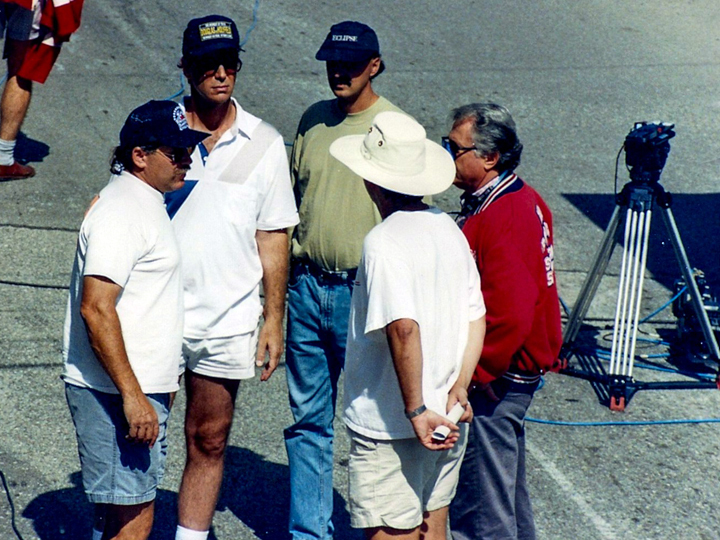 At that time, we moved to Indianapolis as I was hired to oversee the marketing and communications functions for the soon-to-be Indy 500 Champions – Treadway Racing. 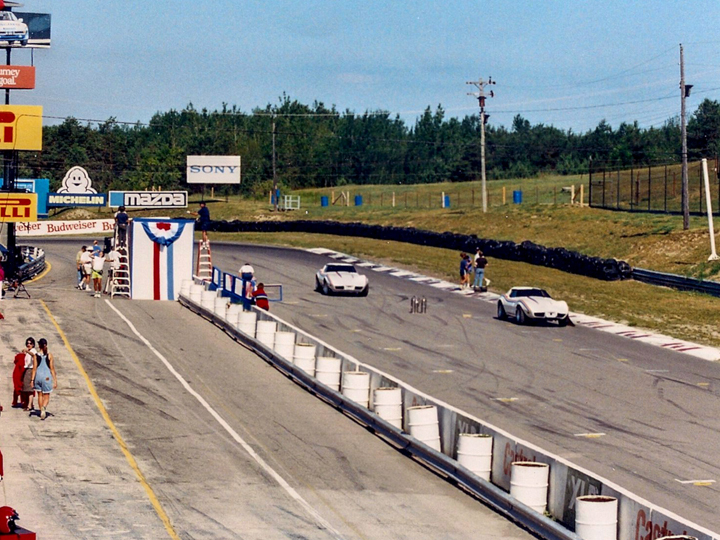 But for the five or six years that we lived in Bowmanville, Mosport became my second home. Not only did I go up just about every weekend, but I also went up for Porsche Club events, track days, private test sessions and other events that were held on the week days. 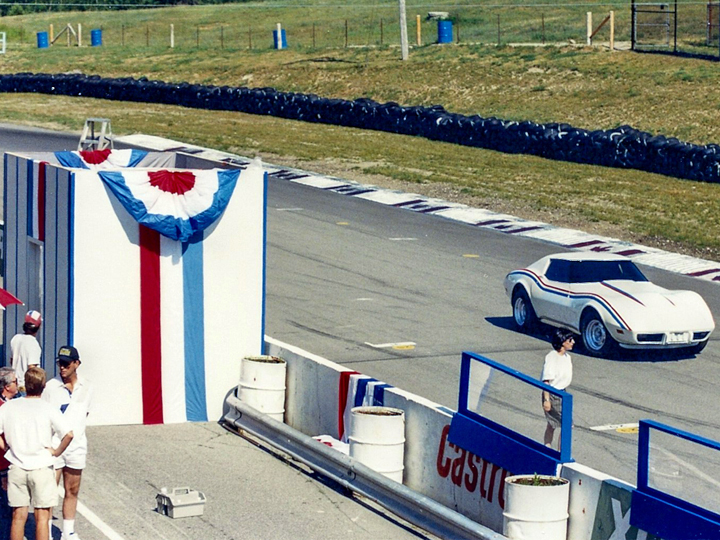 One of the craziest things about my time in Bowmanvlle – in retrospect – was that after school, my daughters would have their friends over – ages 7 – 12 or so – and we’d jump in my Ford Aerostar minivan, head up to Mosport, and we would do laps of the track. That is the type of relationship that I had with the people at Mosport day-to-day. 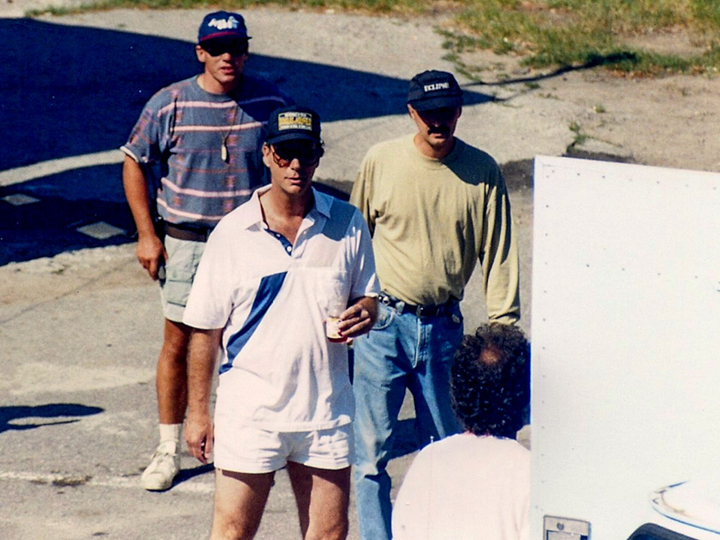 Looking back, I have to think “who would let their 8-year old get in my van to go do laps of Mosport?” I certainly wouldn’t…. 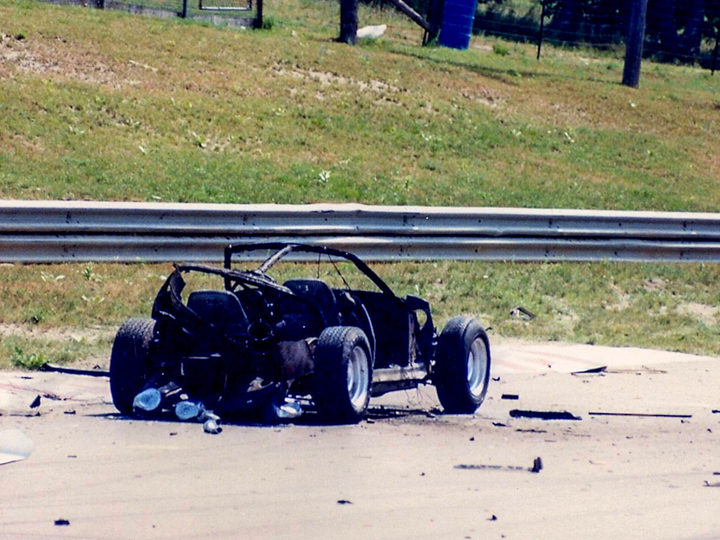 But, that was not the craziest thing that I saw at Mosport in the early 90s. 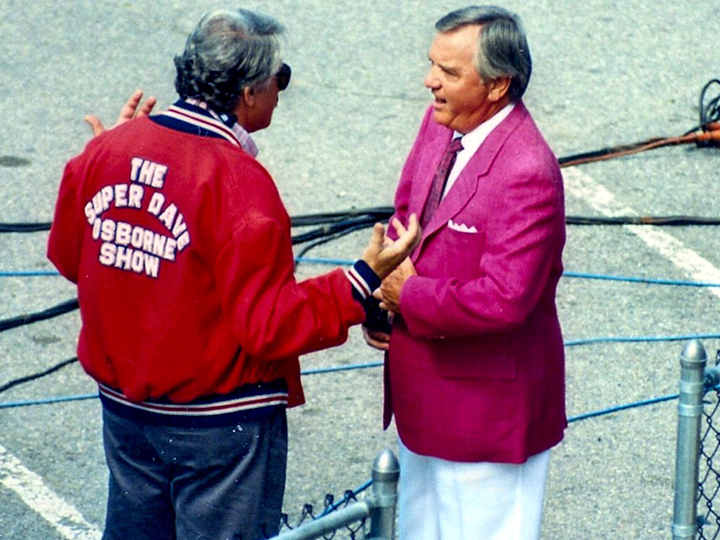 On one of my mid-week visits, I was speaking with one of the track workers who mentioned that I “couldn’t come up tomorrow” because they were shooting an episode of the Super Dave Osborne Show. Wow… cool… I loved that show! So, of course, I told him that I HAD to come up, that I would stay out of the way and no one would even know I was there. He reluctantly agreed, so the next day, up to Mosport I went – camera in hand. 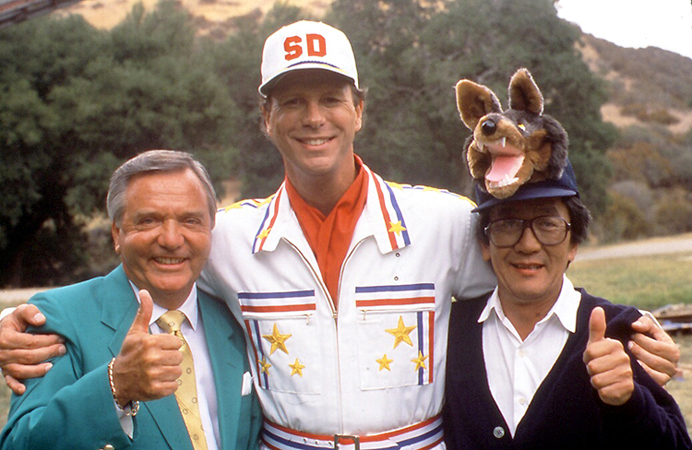 The premise of the show was that Super Dave was treating a bunch of celebrities to a performance driving school. At the time, the Powell Corvette School (don’t recall the official name?) 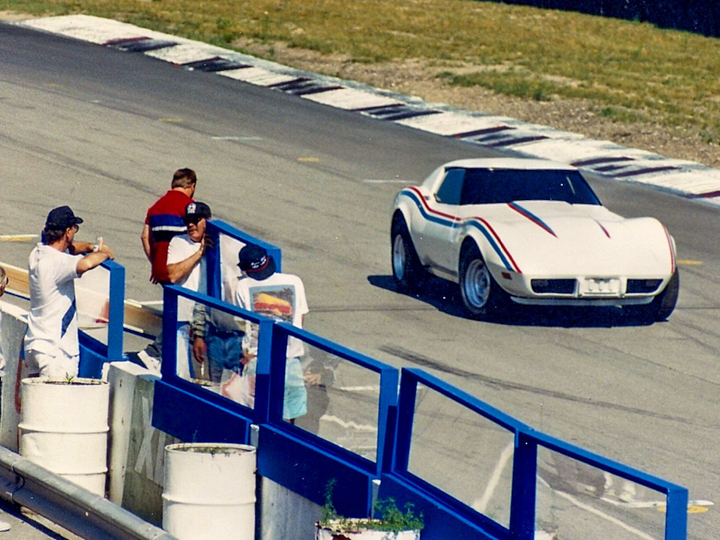 was based at the track, and those Corvettes were all used as props for the show. The celebrity students included Linda McCartney – who was sponsored by Paul McCartney, Oprah – who was sponsored by Stedman, Louis Malle (Google it) and others. 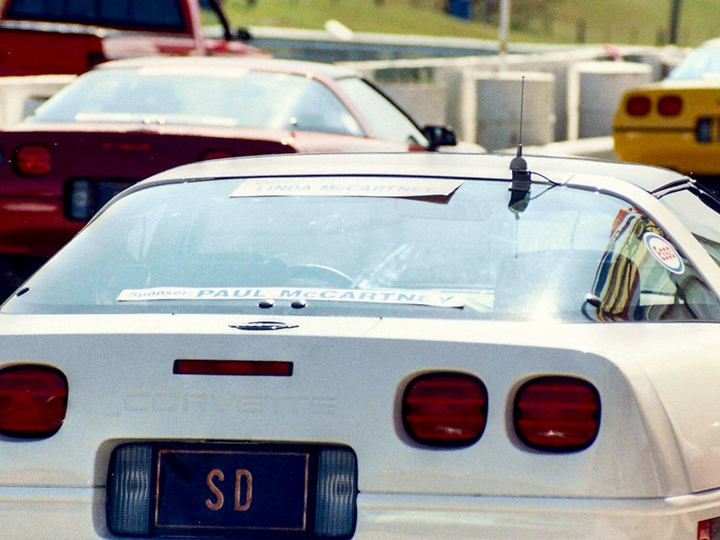 It makes perfect sense that Oprah would need some high-performance driving instruction from Super Dave, at Mosport, in a Corvette…. right? At some point the story line of the show dictated that Super Dave was demonstrating some of the finer points of car control, and of course his Corvette gets blown to smithereens. 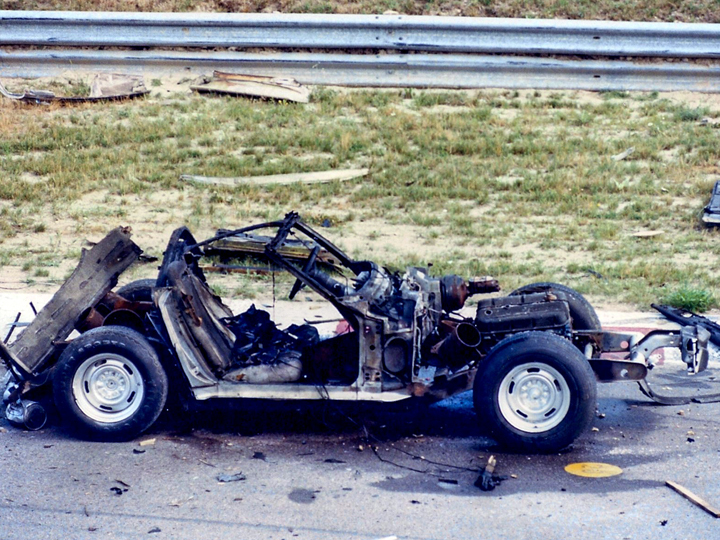 For the explosion, they used a crapified mid-70s Corvette. The on-site explosives experts were very adamant that everyone be “far clear of the bomb blast”. This turned out to be good advice. When the Corvette died it’s unfair death at the hand of the Super Dave script-writers, the explosion totally destroyed the Vette, and also blew the windows out of the tower! Of course, everyone on the cast and crew were thrilled with the carnage. 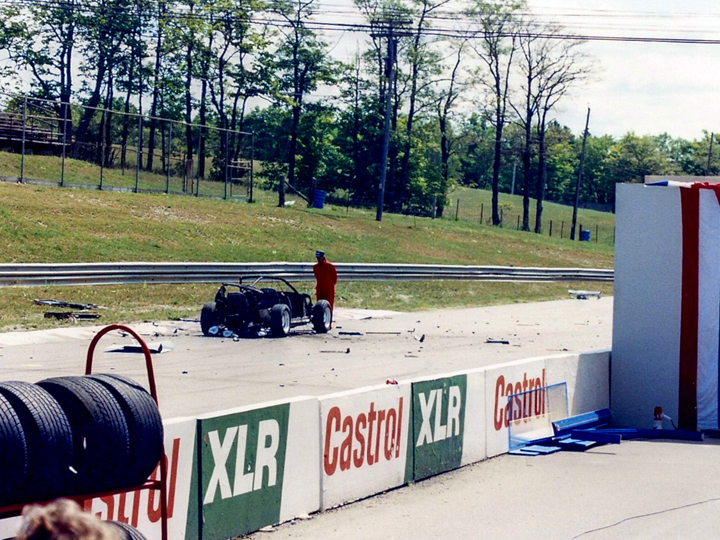 I am sure that this is not the craziest thing that has ever happened at Mosport, but it’s on the list. 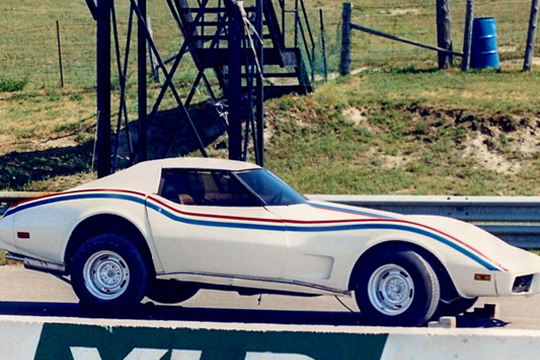 One more thing… amazingly, despite the destroyed Corvette and Mosport tower abuse, Super Dave lived. 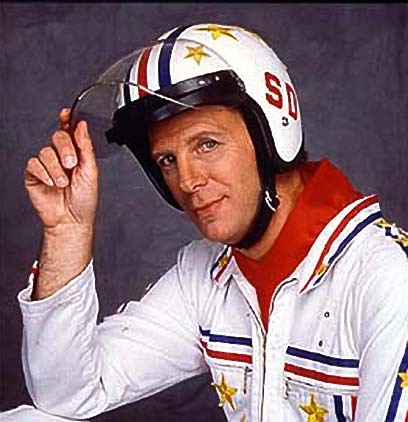 You can read more about Super Dave Osborne here. This entry was posted in Good times! and tagged Bowmanville, comedy, Corvette, explosion, Mosport, motorsports, race track, raceway, Super Dave, Super Dave Osborne, TV by Brandrenaline, Inc.. Bookmark the permalink.